I have noticed that the Hebrew word ‘min’, translated into English as kind, is used many times in association with plants and animals being commanded by God to ‘multiply ‘after their own kind’, but and as far as I can tell, it is never used in reference to ‘Man’ – how do we explain that? In Genesis 1: 11 we read the first reference to a phrase “after its own kind”, which is repeated 10 times in the first chapter where the word ‘kind’ is the English translation of the Hebrew ‘miyn’. The Hebrew word miyn in used a total of 31 times in the Bible, always as part of this phrase “after its own kind”, or “according to their kind”. (see Hebrew miyn in Strong’s Concordance (see ref number 4327 and related 4480). All uses of this word are in reference to plants, animals or birds, but not to human beings. So why is this key word and phrase ‘after its own kind’, not applied to humans, and does this mean ‘mankind’ is free to evolve? 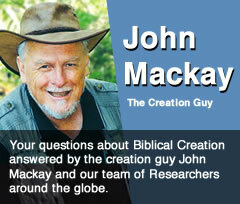 To answer this we need to look at the creation of man, which is described in some detail in Genesis 1 and 2. The first statement about human beings (Genesis 1:26) is that we were created in the image of God, i.e. we reflect God’s nature, even though we are neither God nor part of God, so note that an essential part of the Creator God’s nature is that He does not change i.e. “I am the Lord, I change not!’ and ‘Jesus Christ, the same yesterday today and forever’. Genesis describes the creation of man as Adam’s body being made from the “dust of the ground”, which meant that the Creator Christ (see John 1:1-14) had to get ‘up close and very personal’ and get His hands dirty in order to make man’s body. Human beings are also soul (personality) and spirit, which is the key part of being made in the image of God, who is Spirit, and is the main difference between us and the animals. After God created human beings male and female, He instructed them to multiply and fill the earth. And since God remains the same forever, the only way we could reflect that is to reproduce humans ‘in our own likeness … after our own image’. This phrase actually appears in Genesis 5:3 in relationship to man, when Adam had a son ‘in his own likeness’ and ‘after his own image’, recorded only two verses after we are reminded mankind was created ‘in the likeness of God.’ As there were no other human beings except Adam and Eve when God completed the creation, and Eve was given her name because it means “mother of all, all people who have lived ever since are descended from this one created couple. This means when we put all this together, it is clear there was, and is, and will be, only one kind of human, which can only reproduce ‘after our kind’, as we are actually observed to do in the real world. Therefore there was no need to describe humans as being “after their kind”. The reason why evolutionists are such hypocrites is that they may proclaim loudly their belief in evolution, but they never do it. In fact mankind does not do evolution at all!